Engaging in meaningful activities promotes bliss. Activities that provide meaning do so by engaging your values, what you feel is important. When your activities are important, you're doing something that makes a difference. 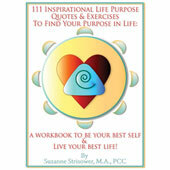 You are infused with a sense of purpose, which lifts you above the mundane and the dreary. Bliss is the enjoyable feeling of well-being experienced when you're fully involved with what you are doing. There is a sensation of being in harmony with your surroundings. Loss of self, where you feel "one" with the activity and the moment, is among the most notable characteristics. There is no sense of separation between you and what you are doing.